Hot on the heals of Brian's excellent summary of the 4636 Project development efforts, I'd like to join in with a little info-graphic of sorts. 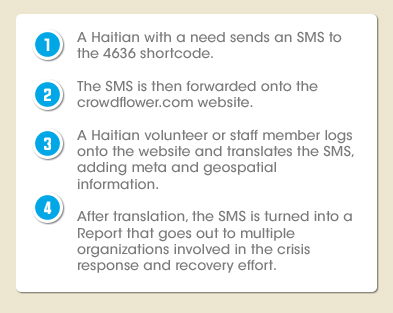 My goal in putting this together is to present an easy-to-understand "big-picture" graphic that illustrates how a simple SMS, sent from a Haitian in need, can be transformed into a powerful resource that fuels the crisis response and recovery effort. 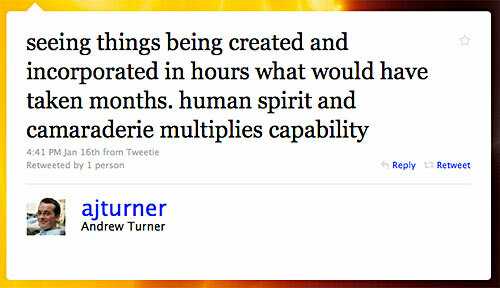 [caption id="attachment_1440" align="alignnone" width="500" caption="Andrew Turner: "seeing things being created and incorporated in hours what would have taken months. human spirit and camaraderie multiplies capability""] [/caption] For someone who's recently come from the competitive creative agency world of non-disclosure and trade secret, it's a breath of fresh air to see this level of collaboration between individuals across organizations, and to see that collaboration play a direct role in helping those in need. Please note that this "big-picture" graphic is just that, a "big-picture". 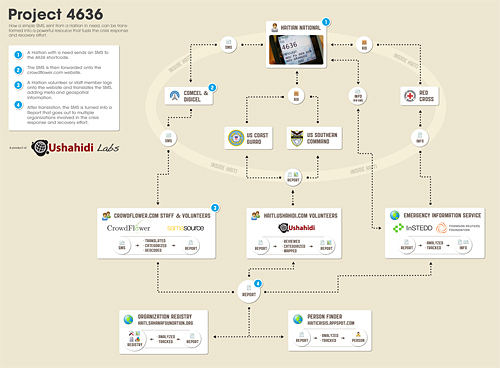 It does not attempt to represent ALL the organizations and people involved with the 4636 Project. There have been lots of folks who have done great work here who we can't even begin to name.